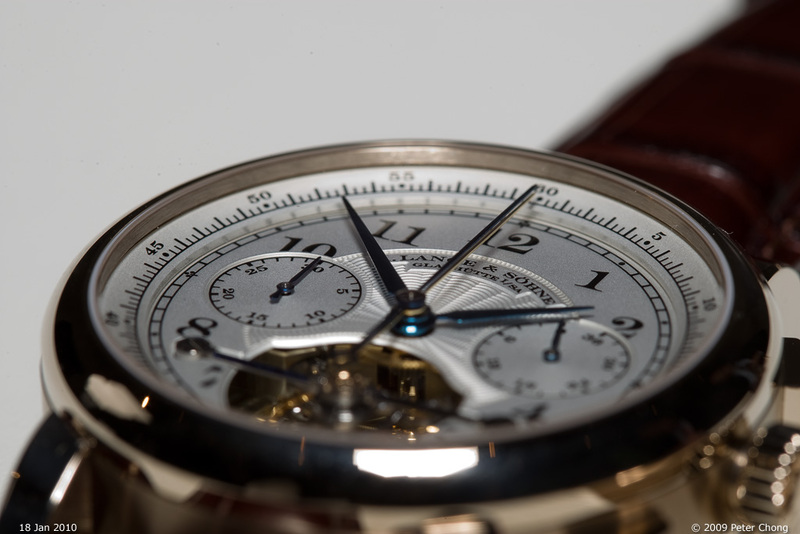 I will begin a series, on Wednesdays to republish the reports and photographs I took during the SIHH 2010 in Geneva. These have been previously published on the forum I moderate at TimeZone.com. These encore articles will be published every Wed.
And the LOGers conference, where the novelties were presented to the friends of Lange on Day 4. First the Homage Series in honey gold. The gold was a really lovely colour (color...I habitually spell in UK English...)...a tad warmer than yellow gold, and more discrete than rose gold...it is certainly a beautiful hue...as I understand it, this is a totally new metal alloy of gold, 18k, and Lange has exclusive use of it for some time. The new Tourbograph in honey gold. When it was launched some years ago, the Tourbograph was launched as a limited edition set of 101 pieces (100 for sale, and 1 kept in memory of Gunter Blumlein). The first 51 pieces were delivered to keen collectors (as I understand, actually 50, the factory kept 1) in platinum...and we waited with bated breath for the next 50...we knew it was going to be in gold, but what colour? So it is with great interest that the following 50 pieces of this magnificent grand complication of sorts is revealed in the new metal. 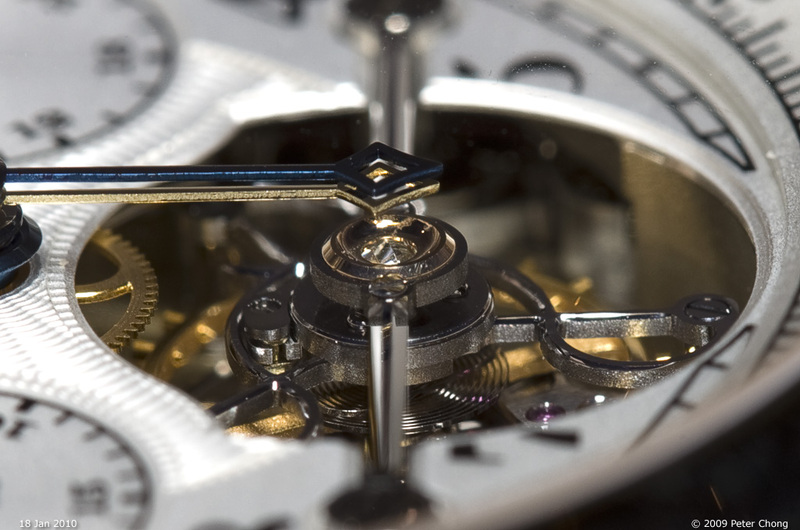 Detail of the tourbillon, beautiful as ever...Note the exquisite finish on the tourbillon bridge, and the anglage on the polished steel tourbillon cage. 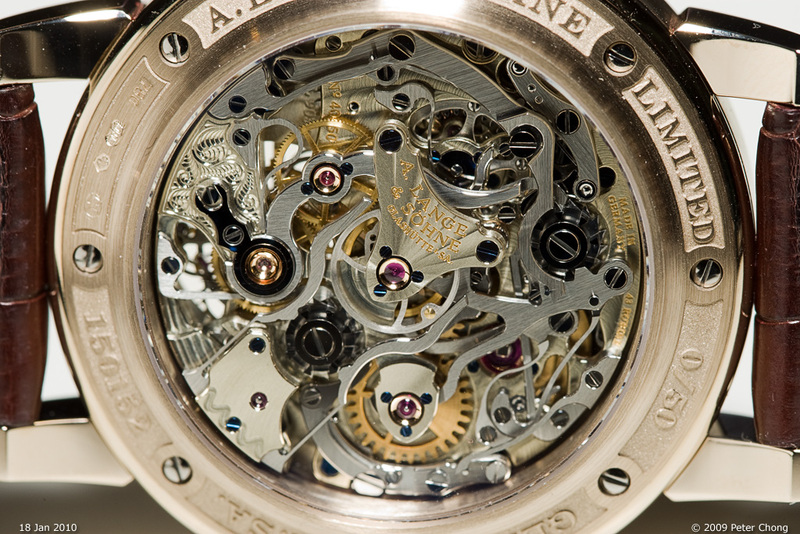 The movement is largely unchanged, except for some decoration...now featuring a sunburst finish instead of the traditional Glashutte ribbing. 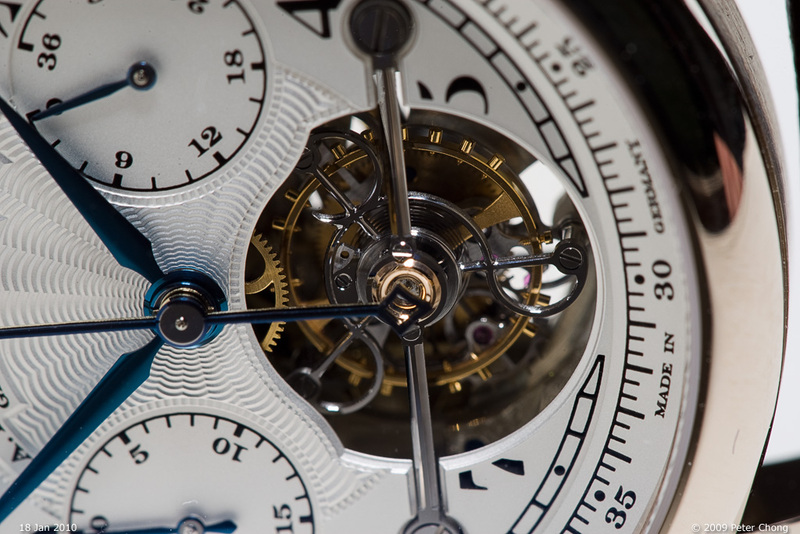 Detail showing the double chronograph hands...blue on top, and the split hands below. This picture also shows clearly the diamond endstone characteristic of the Tourbillons, and a clear view of the overcoil on the hairspring. 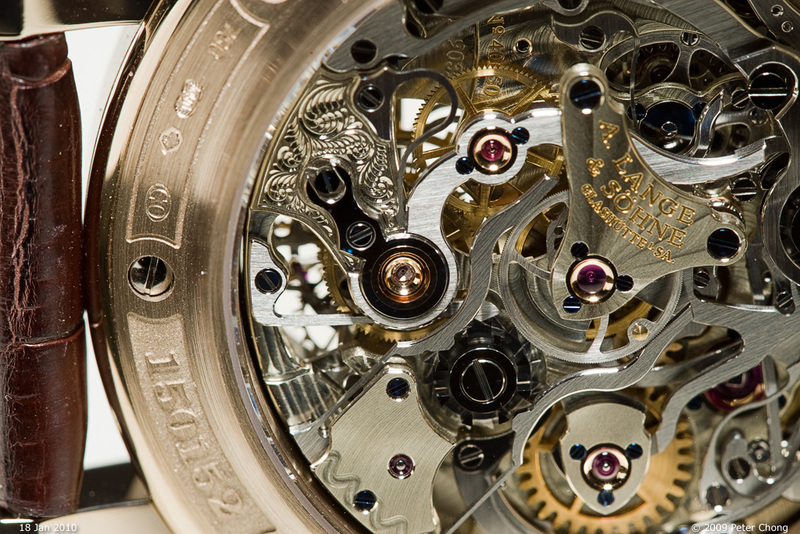 Detail of the tourbillon on the rear side. Also showing the new decoration...the sunburst on the chrono wheel bridge, and the engraving on the outer of the movement. 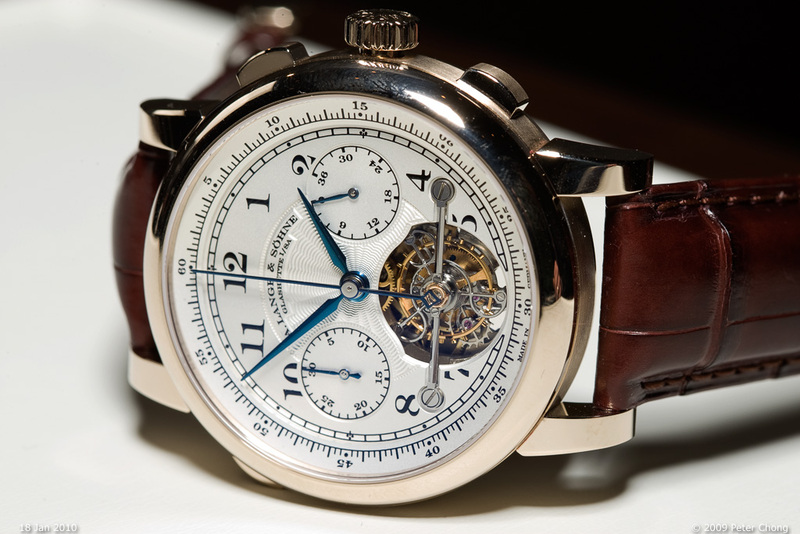 Note also the magnificently executed sharp points on the bridges and even on the steel chronograph parts.